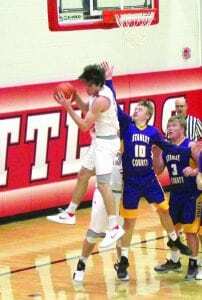 This was one of the eight rebounds Potter County Battler and GHS senior Dawson Simon was credited with during the game against the Stanley County Buffs at home on Jan. 8. Simon also managed to score 25 points against the Buffaloes, followed by his co-captain Cole Nafziger who added another 21 to the 65-59 final score. The basketball teams head to Bowdle on Thursday night for a double header against Eureka/Bowdle, before being back at the GHS gym the next night for a double header against Sunshine Bible Academy. If you can’t make it to the game on Jan. 25, it will be livestreamed at www.pottercountynews.com or you can catch it on the local cable channel 387. Simon is the son of Pat and Diane Simon.